I used this company in different hotels, like Aqua soll and Akteon holiday village, and Eleni was the worst!!! Only positive staff really wanted to help with my car trouble. Rest was just bad. The only pleasant staff were the night porters on the night of the 7.09.18. It was a Liverpool man along with a perhaps cyprian man. Very welcoming and friendly unlike all the other staff. The room was spacious but old fashioned. 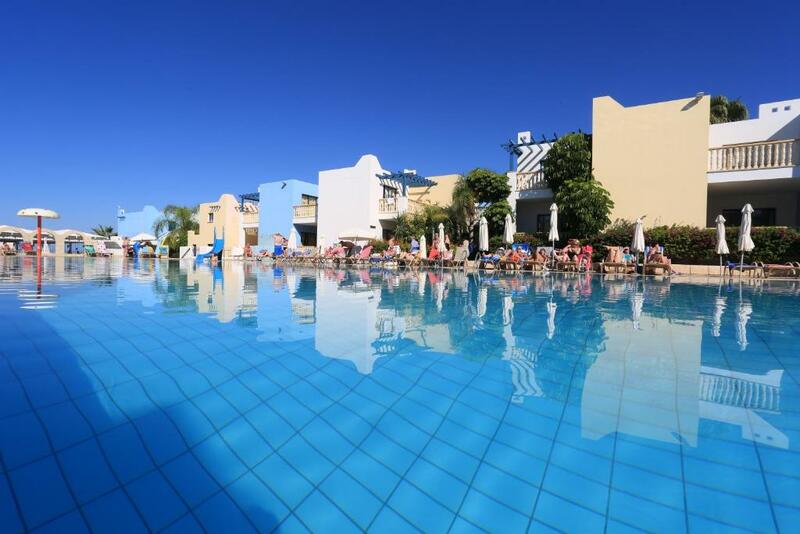 The pools were great, big pool area for both adults and children and sun loungers all around. The bus to coral bay and harbour are 3 min walk from the hotel. Easy access to airport from harbour. Large swimming pool. Totally kids friendly facilities. Good entertaining program and daily sports activities. Mini market available within the hotel with normal prices. Friendly staff. Near the beach. Nice view of the sunset from the pool. The pool was great. The staff was very friendly except for a few. Food was ok. The most important was the staff they were friendly helpful and good communicators. The look of the place was great and the pool super. The location was also very good and the walk to the beach was near. Also great beach bar Ammos. The walk to the beach could have had some solar lighting as it was dark when walking back. The staff in entertainment exceptional as well as the restaurant (only breakfast) and the reception staff brilliant. The ladies who cleaned the room perfect. so all staff 10 out of 10. ОГРОМНАЯ БЛАГОДАРНОСТЬ ДЕВОЧКАМ В ОРАНЖЕВЫХ ФУТБОЛКАХ! А особенно: LIA, Elena и MEGAN. Без их участия наш отдых был бы очень посредственный. Очень понравилось и отношение и то, как Девушки коммуницируют между собой и с отдыхающими, создавая очень дружественную обстановку. Считаю, что именно Они украсили мое прибывание в отеле. Тихий, уютный отель с приветливым персоналом. Прекрасное место, где можно выспаться. Для данного ценового сегмента - очень неплохо. Пляж в 3х минутах ходьбы. Жила в нескольких отелях на Кипре - этот понравился больше всех. Ωραια τοποθεσια, ωραια τα σπιτακια με ωραια θεα, τελειες πισινες. 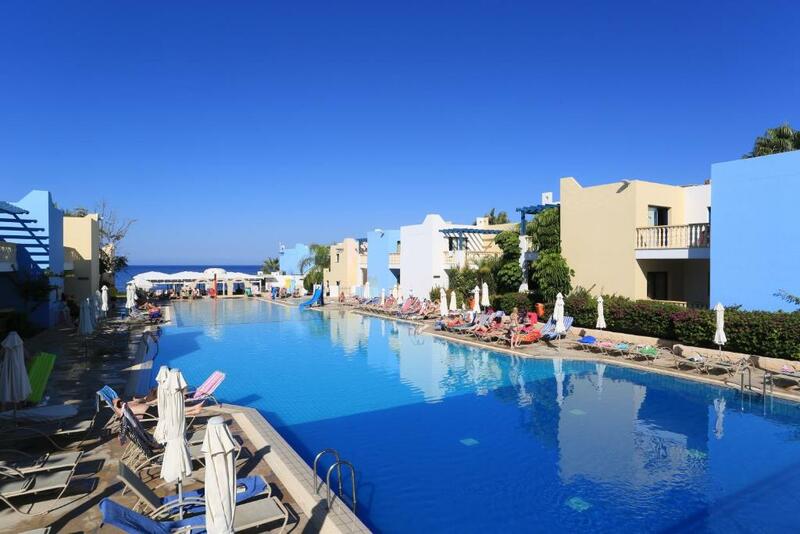 Eleni Holiday Village This rating is a reflection of how the property compares to the industry standard when it comes to price, facilities and services available. It's based on a self-evaluation by the property. Use this rating to help choose your stay! Overlooking the beautiful seafront of Chlorakas, Eleni Holiday Village offers spacious accommodations set around a huge landscaped pool area. It features a variety of sports facilities and organizes entertainment programs. 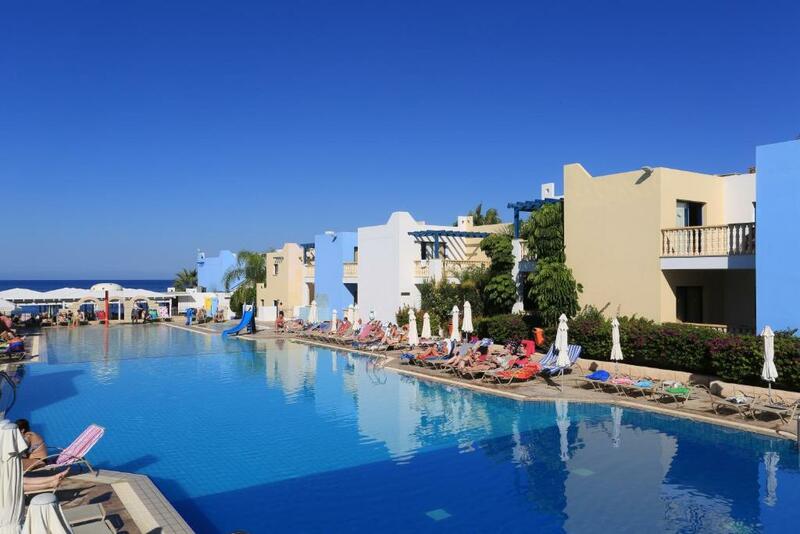 Tastefully decorated, Eleni rooms open out to a furnished balcony with views of the grounds or sea. 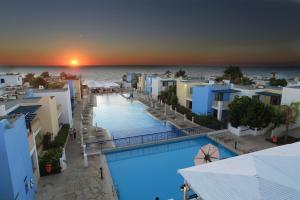 Each is equipped with air conditioning, TV and a well-equipped kitchenette. All units also include a dining and a living area. Guests can relax at the hotel’s sauna or enjoy a massage session. The more active ones can visit the well-equipped fitness room, play tennis or water volleyball. During the winter months an indoor heated pool is available. The main restaurant serves local and international delicacies, while in the summer there is also an open-air restaurant. The main bar and the pool bar offer a variety of snacks, drinks and exotic cocktails. Paphos Airport is a 20-minute drive from the complex. The center of Paphos can be easily reached by bus or taxi. Free on-site parking is available. 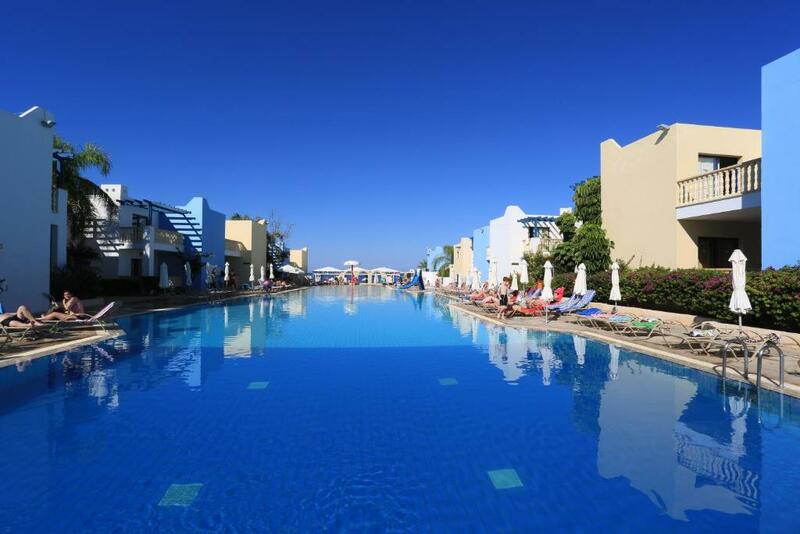 When would you like to stay at Eleni Holiday Village? This studio features a kitchenette and a sitting/dining area with garden views. Spacious apartment offers a separate living area and garden views. Please note that the room rate includes up to 4 guests. This studio features a kitchen and a sitting/dining area with sea views. Spacious apartment offers a separate living area and sea views. Area Info – This neighborhood is a great choice for travelers interested in sunsets, relaxation and sunshine – Check location Good location – show map Guests loved walking around the neighborhood! House Rules Eleni Holiday Village takes special requests – add in the next step! Eleni Holiday Village accepts these cards and reserves the right to temporarily hold an amount prior to arrival. Rooms full of aunts, as it was end of season food options was very limited, same with drinks. Staff was really missarable, sometimes I felt like not to ask for anything, we went out for dinner even staying all inclusive, as we couldn't just eat same thing over and over again. I had to change to a near by hotel when I arrived, I was informed when checking in I would be able to stay at my new hotel for the duration of my stay only to then get a wake up call early the next day with me being told I had to leave and go back to the Eleni. Once in the Eleni, I then never had hot water in my room for the entire stay. The room.Book for studio with sea view .and they give one bedroom apt.full of ants and the view it was some tree and pipes. The tv.is was very old .Just 5 channels. Upon our arrival they announced to us that we had to move ourselves to a Hotel of the same Group. Fortunately the Hotel - AquaSol was rennovated. The next morning cleaners opened the door twice while we were asleep; without even knocking. Pictures lie. A good photographer in photoshop makes them beautiful. Service offered after a row change of room but the next two rooms were even worse. The rooms smell of mold. The hotel has not 1 star and bookin.com described them as 4 stars. After talking to the local people, we learned that 16 years ago all the stars had been taken away from him. Service very unpleasant. Breakfast disgusting. All the worst quality. We paid as for 4 stars and received the quality of a poor hostel. Big wine lies after booking.com because they do not check with whom they sign a contract. Needs desperately upgrading, pool area very crowded. This was not a 4-star hotel at all! The staff were very unpleasant, very tired and lost looking. We reported to reception (afternoon 8.09.18) that our air-conditioning was not working (it was extremely hot in the room on second day). She didn't care at all, just took room number down and mumbled that maintenance will be sent. Not even an apology, and nobody was sent up to fix it, so we complained again the next day after which the air con was back working but with a beeping cricketing noise. We decided to get lunch there one of the days, again staff not welcoming, didn't show around buffet, food selection was okay. The drinks had to be purchased separately from a different waiter, then another waitress was sent to deliver the drinks but was lost and we had to announce that the drinks were for us. Again no smile no acknowledgement whatsoever. The hotel does not provide ANY TOILETRIES (this is quite unusual for a four star). Hairdryer was only available if you left a 10 euro deposit, and a very slow service from reception again. The toilet in the room did not flush properly had to be pulled 5 times to get some water, and also toilet paper was not to go into the toilet!! Signs to say to put paper into the bin! Which is quite an old and disgusting system which I would never expect in a 4 star. The pressure in the shower was terrible, especially for anyone with long hair. Thank God we only stayed for a long weekend, would definitely not stay for longer or ever again. We stayed in Paphos before and never encountered such terrible service. No sponge nor soap for washing dishes. No comfortable pillows; you should definitely take pillows with you. No shampoo, shower gel, body cream, sanitaries, nothing apart from soap for the hands. There was an explosion in the parking (no safety) No outdoor showers near the pool The indoor pool was closed and the staff didn't give us the key to the gym( if there was a gym) The room was smelly and the staff didn't do anything about it. The staff didn't speak any language except from russian. The hotel was amazing..it was very clean and the staff was very good..!! The room was veeery bad. There were spiders, lizards , a cockroach and lots of ants. The kids beds were very uncomfortable. The lady at the reception was totally ignorant and rude.